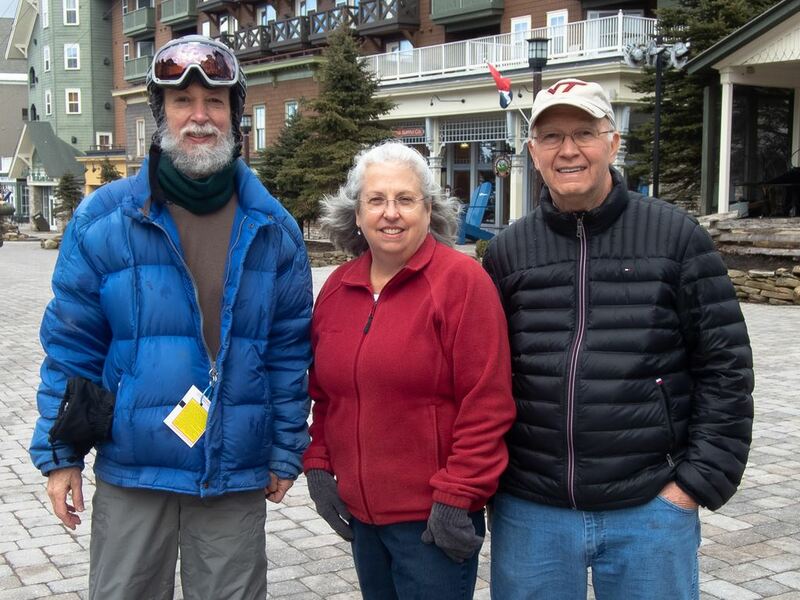 Thirty-three of us participated in the 2019 Snowshoe Ski Trip organized by Susan Crockett. We thank Susan for her usual creativity, helpfulness and attention to detail. The trip price was $727 ($702 with early registration), which paid for five nights’ lodging, four days of skiing, a wine and cheese party, and a restaurant group dinner. With variable snow conditions, including two rather warm days and two rather chilly days, we were able to ski all four days at Snowshoe Basin, the Western Territory, and Silver Creek. On different days, different combinations of the 60 ski trails were open. Many times we were making our own tracks in unskied snow; I found a particularly pleasing run, Progression Park, which was marked as a terrain park and indeed had jumps down the middle of the run but relatively unused, wide, skiable areas to the sides of the jumps. The slopes were shared by snowboarders and skiers. I was intrigued by the sound of the Magic Carpet lift but didn’t try it since, unfortunately, I’m not a kid. principal goal of the ski trip. Snowshoe is about a 5- to 6-hour drive from the Peninsula by any route, making it the closest ski area of medium size. The shortest route there, Staunton and then the switchbacks to Cass, was fine going up. We heard it was okay coming back too, but most chose to go south to I-64 due to uncertainty about road conditions east of Cass. On the drive, many went to Mrs. Rowe’s at Staunton for lunch, some going and returning. This has almost become a PSC tradition. The restaurant has great Southern style food, reasonably priced, and bakes a variety of pies and cookies daily. Due to a water leak problem at Rimfire before we arrived, the group was divided into two, with some people assigned to the Rimfire Condos and others assigned to the Allegheny Springs Condos. 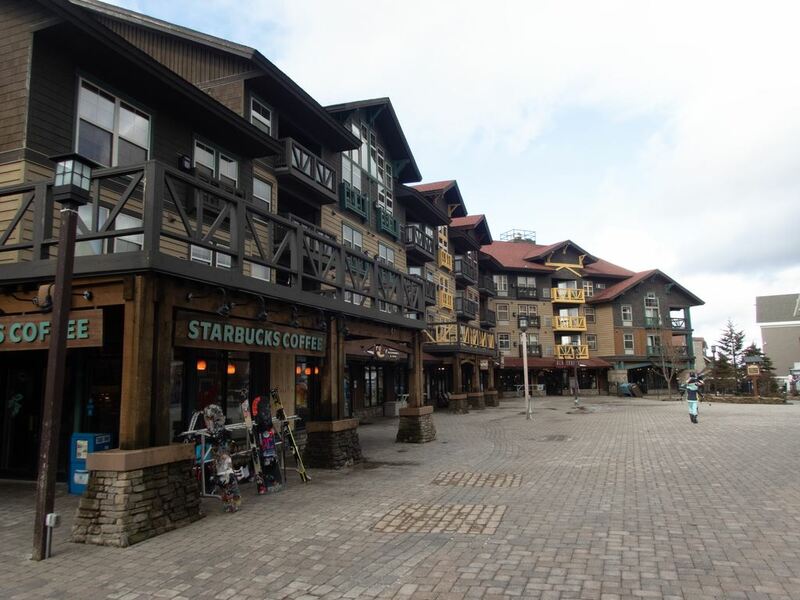 Both of these buildings were located at the Snowshoe Village, extremely convenient to the ski slopes. Trip members enjoyed the ability to take breaks and eat meals in their own condos in between periods of skiing/snowboarding. We learned that the condos were individually owned, with maintenance apparently up to the owners. So while our condo was toasty warm and clean, some of the appliances, such as TV’s and the fireplace, were unusable. The proximity of the two buildings allowed visiting back and forth, which we did on two nights when we had the Wine & Cheese Party and the Potluck Leftovers Party. These parties provided very good hors d’oeuvres, enough to make a meal. All of the get-togethers were fun and the food, delicious. Several people commented that they would like to have a large communal area available for social events. The Village provided restaurants (The Junction was an excellent one), pubs, and a number of skiwear and ski rental shops close at hand. The Village bus stop allowed easy access by bus to Silver Creek, which opened at noon. I observed parties of people snowmobiling at night and learned that horsedrawn sleigh rides near Silver Creek were another non-ski option. A short bus ride took us to the Appalachia Kitchen Restaurant, where we ate dinner as a group. This dinner gave us ample opportunity to relax and visit with new people. A ball hooter is not a member of the male anatomy, but rather a person who rolls or slides logs downhill. There is another Liberman, related to Steve, roaming about Virginia Beach. 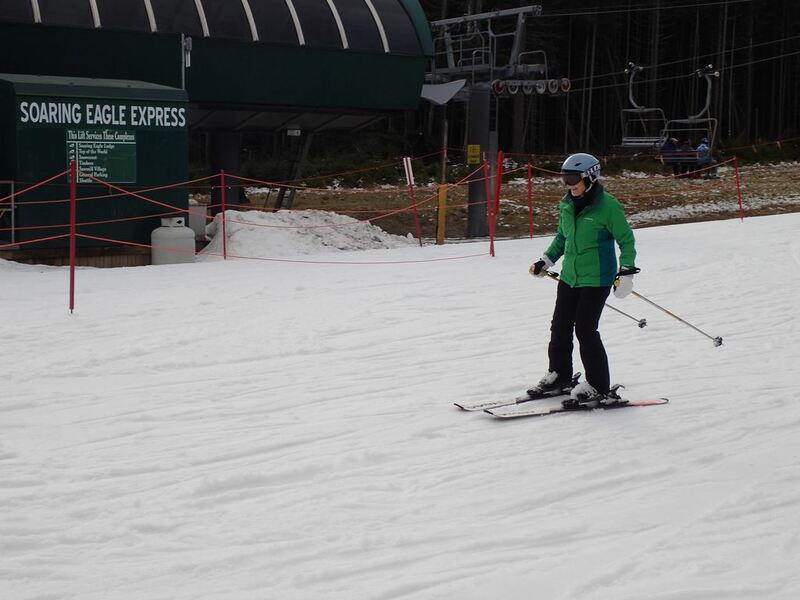 My bindings work, but I still need to learn how to reattach my skis unaided on a moderate slope. The product called “Slide On” boot spray actually works to help get your feet into stiff boots. Four years of age is the recommended time for children to learn to ski. Conclusion: Conditions were not up to usual for Snowshoe, but still skiable, fun, and 1,000% better than not skiing! Wind blowing snowfall sideways and all out snow-making look bad on a webcam, but it’s still skiing! Our nice, cooperative, and fun PSC gang made this an enjoyable ski trip.